WayPoint Outdoor Power Supplies provide a better power solution for both PTZ and fixed cameras, heaters/blowers, IR illuminators or virtually any video surveillance or security products exposed to the elements. Along with all the functionality and versatility you need. Altronix HubWayEX16SP Active UTP Transceiver Hub w/Integral Isolated Camera Power employs automatic gain control (AGC) to transmit UTP video, RS422/RS485 data and power over a single CAT-5 or higher structured cable. Unit provides 16 camera channels in a space saving 1U EIA 19” rack mount chassis which may be rack, wall or shelf mounted. Video transmission range is up to one (1) mile max. per channel. Units are compatible with AC and/or DC fixed or PTZ cameras when utilizing Altronix HubWayAv, HubWayDv Video Balun/Combiners. In addition, the unit features individually selectable 24VAC or 28VAC PTC protected outputs with surge suppression. An optional HubSat4D/4Di Passive UTP Transceiver Hub with Integral Camera Power can be used as a remote accessory module to transmit video from up to 4 cameras over a single CAT-5 or higher structured cable back to the HubWayEX16SP. In addition, the HubSat4D/4Di provides power to these cameras locally to eliminate the possibility of voltage drop associated with long cable runs. 115VAC 60Hz, 0.4 amp or 230VAC 50Hz, 0.2 amp. Sixteen (16) channels of video over twisted pair up to a distance of 5000 ft. per channel. Automatic picture and gain control. Automatic compensation for reverse polarity wiring (video). Includes sixteen (16) 2 ft. coaxial jumper cables. 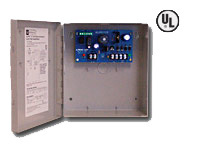 UL Listed for Access Control Systems (UL294), Power Supplies for use with Burglar-Alarm Systems (UL603). 1.75 amp @ 12VDC output. 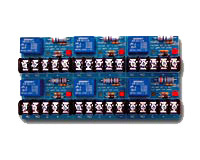 10 amp/120VAC/28VDC SPDT contacts.Each cluster contains six (6) relay modules which can easily be separated. Screw terminals accommodate up to 12 gauge wire.